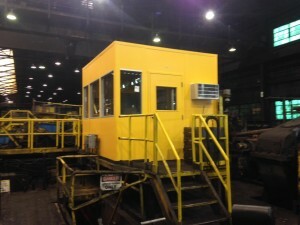 Modular building panels can be used to provide a cleaner environment for your shop equipment. CMM, or coordinate measuring machines, are a piece of equipment that uses a physical or laser probe to map out the geography of an object. They are very precise machines and need to be kept in a clean and often temperature controlled environment. I recently had a customer who found this out the hard way when the dust in the air due to production was messing with his machine, so he contacted us looking for an equipment enclosure. 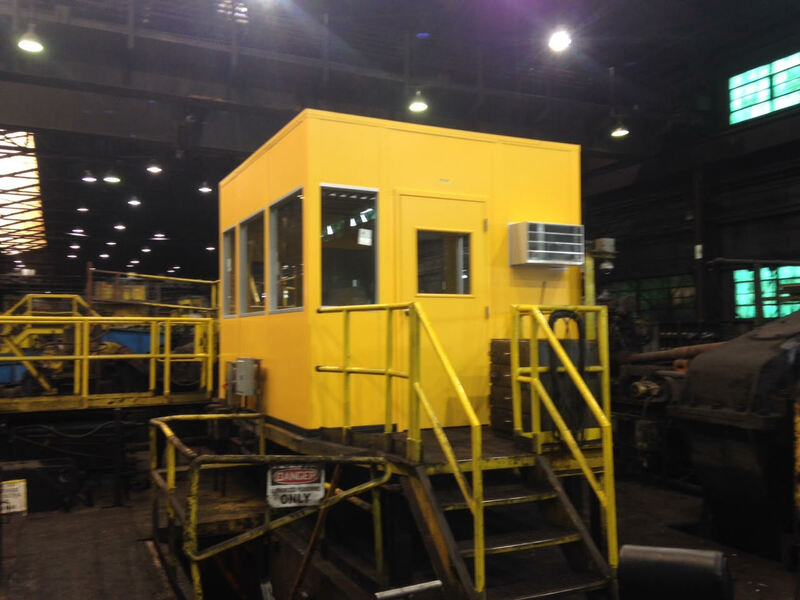 Using modular building panels, we designed a 16′ deep by 20′ wide four wall enclosure. Due to the maximum height of the mast on the CMM, the customer needed a lot of available head room in the area, so we stacked panels up to 13′ using the A-wall 300 system, leaving us 12’6″ of available head room under the drop ceiling and recessed lights. The customer wanted a way to easily remove the CMM if he needed to in the future, but didn’t want to put in a large door. In order to facilitate this, we put in a 8′ wide by 9′ high removable panel assembly using a tubular steel “goal post” and some additional trim pieces, so if he did need to move the equipment he would just need to remove the extra trim pieces on the outside and pop put the panels. 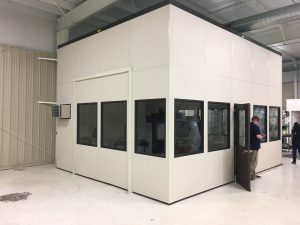 The customer wanted a lot of windows in the enclosure, and since the A-Wall modular building system’s windows are factory installed right into the panel as a single piece, we were able to put one in every 4′ panel (aside from the one with the HVAC system) that wasn’t facing their wall, including the two removable panels. 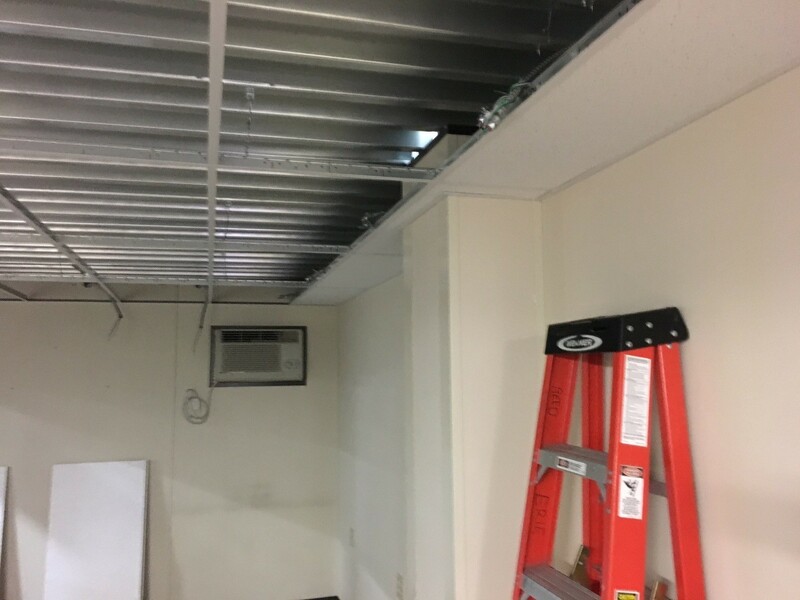 We also outfitted the room with Flex-4 modular wiring inside the wall panels in order to save the customer money on the electrical installation. The removable panels provide the customer with easy access to the equipment should they need it. Upon contacting us, the customer was looking for a quick solution. After receiving the order we were able to send him approval drawings the next day. He was able to quickly turn around the approved drawings so we were able to ship it out to him in two weeks. The installation took a two man crew two days to complete. Twenty two days after we received the PO, the customer had this great looking equipment enclosure assisting with the smooth operation of the CMM. 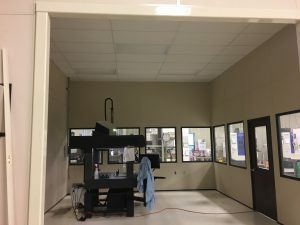 This entry was posted in clean rooms, modular enclosures and tagged CMM enclosure, Equipment enclosure, modular building, modular building system, panelized building system, white room on January 28, 2019 by Derick. 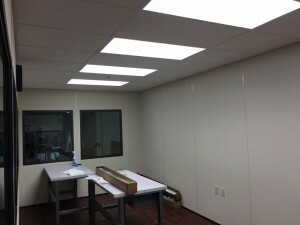 Looking to expand your modular office, but that I-beam is in the way of the wall panels? 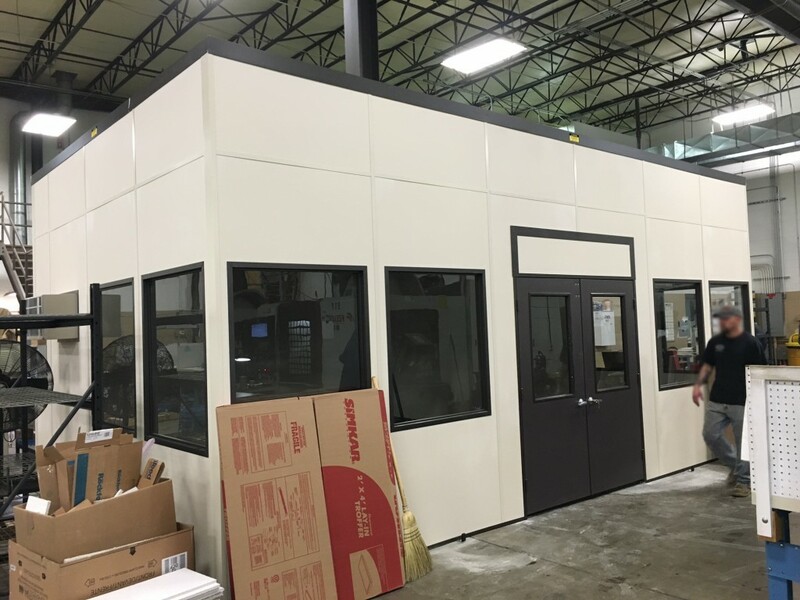 One of the greatest advantages of using modular wall panels for your in-plant offices is their ability to easily change and grow as your needs change. Back in 2010, we provided a customer with a 20’x12’ modular in-plant office with an internal wall, splitting the space into two separate offices. A few years later they decided to rearrange the wall panels, taking out the dividing wall and creating one large office space. Earlier this year, the customer contacted us again looking to further expand upon the room, adding an additional 16’ to the system. This is an easy modification to make. Typically you would just disassemble the end 12’ wall, add four new 4’ modular wall panels to each of the 20’ long walls, and then close it back off with the existing 12’ end. But this extension offered a little twist that I thought we could talk about today. There was an I-beam right where the wall panels would go through. If the wall panels fall between the flanges, the most cost effective method would be to terminate the wall on both sides of the webbing and secure it to the I-beam using some 1”x6” angle and an internal stud. 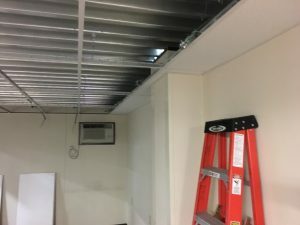 This is not the cleanest method though, as the I-beam appears to cut through the wall and typically leaves a gap in the grid ceiling inside the I-beam. 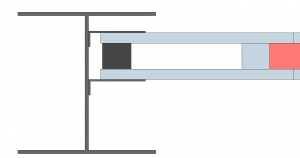 In this particular case the flange of the I-beam lined up with the outer sheet of gyp-board, creating an obstruction. Because of this we simply boxed around the I-beam with wall panels, closing it off. While this method requires a bit more in the way of materials, it allows for a very clean and uniform appearance. The view from inside the finished modular office extension. 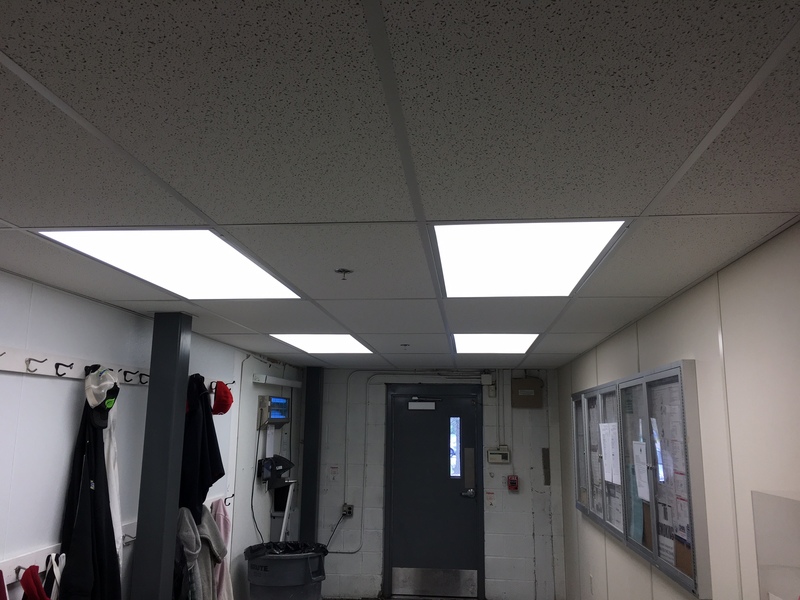 This entry was posted in acoustic control, clean rooms, installation, modular enclosures and tagged installation tips, modular building, modular office, office expansion on January 31, 2018 by Derick. 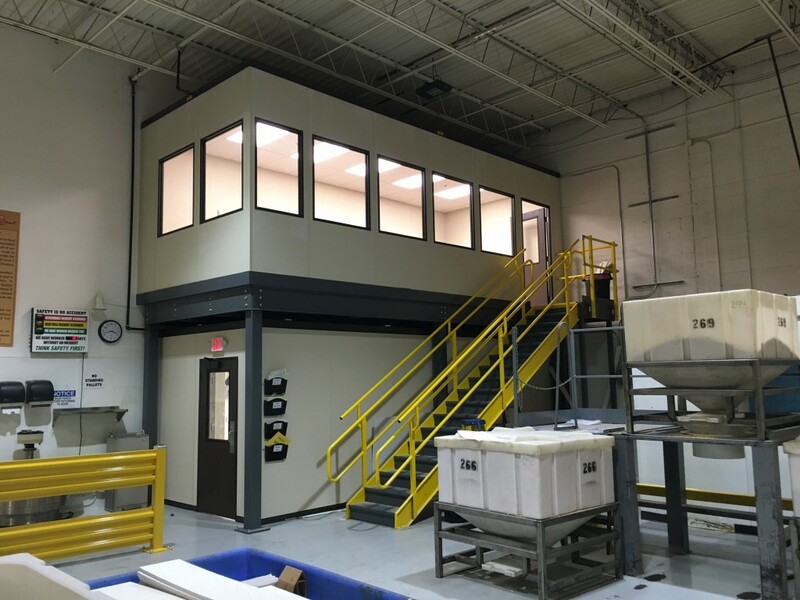 Whether you’re running out of room on the plant floor or need to oversee production, mezzanines are commonly employed to support and elevate modular buildings. Recently we received some great photos back on a project we completed last month for a mezzanine supported modular office that I thought you might like to see. The customer was located right here in Northeast Ohio. They were putting in a new line on the plant floor and needed to tear down some offices they had in order to make room. There wasn’t enough space to relocate the offices elsewhere on the plant floor, so they decided to utilize some of their unused overhead space. A 9’ high mezzanine supported modular office with an 8’ high modular wall system below. When thinking on putting in a mezzanine supported modular building, it’s important to consider just how much space is available. Remember that with typical column spans in low seismic areas, you’ll probably lose 1’3” to 1’5” for the mezzanine itself. If you plan on having people move through the area you will need to maintain a minimum of 7’ for clearance. The modular building panels are typically 8’ or 9’ tall, and unless you are planning on supporting them by the structure above, you will probably want about a foot more in order to install the roof deck to the panels which helps form the membrane that holds the system together. In this particular case the customer’s mezzanine had a clearance height of 8’7” with a 9’10” top of deck. 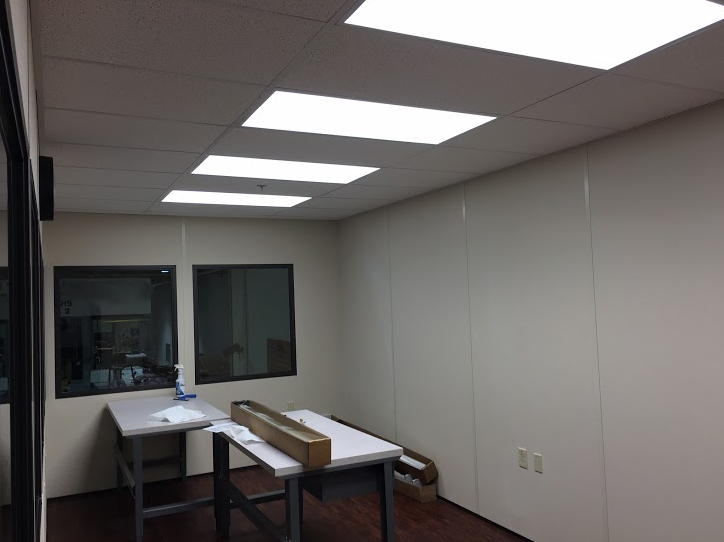 This provided us enough room to install a modular office above (9’ tall panels, 9’3-1/8” overall height, 8’6” clearance height) and an 8’ high (8’3-1/8” overall with a 7’6” clear ceiling height) modular wall system below. While designing these mezzanine supported modular offices, we’re often asked if we can utilize the adjacent existing walls. While this is commonly done on the main floor of a facility, unfortunately we cannot do this up on top of the mezzanine deck. There will always be some movement and vibrations on top of an elevated structure and because of this the structure would need to be a four wall system and not tie into the adjacent walls. 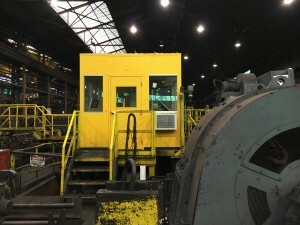 In this particular care, we put in a four wall system above the mezzanine deck as well as a two wall system below the deck to create an enclosed pass way between the production floor, the front offices beyond the cinder block wall, and the production floor entrance way to the outside. It took our installers 6 work days to unload and install (both mechanical and electrical) the 24’x10’ mezzanine, the 24’x10’ 4-wall modular office above, and the 9’x22’9” two wall modular wall system below, and we had yet another very happy customer. 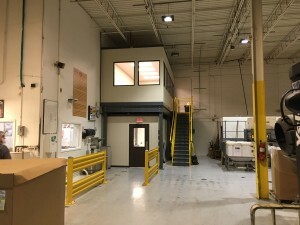 This entry was posted in acoustic control, Elevated structure, mezzanines, modular enclosures and tagged elevated structure, mezzanine, modular building, modular office on June 10, 2016 by Derick. A very common application for modular buildings is as an equipment enclosure. The customer is trying to cordon off an area on their production floor to encapsulate a certain process. Sometimes they are trying to isolate the sound it produces. Sometimes they are trying to isolate it from a dusty environment. A lot of these machines, such as CMM machines, won’t fit through a 6’8” or 7’ high doorway. Once the equipment is in place it usually stays there for many years, but customers often want the ability to get it in and out of the room on rare occasions should the need arise without having to disassemble a good chunk of the building. 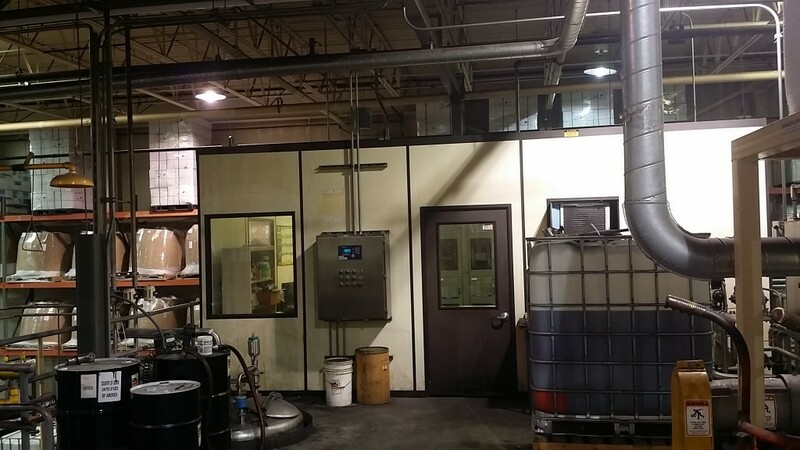 For a doorway that will only be used once in a blue moon, it’s rarely cost effective to order a custom swing door, or put in an additional canister style door for equipment access. A much more cost effective method that we’ve found is to put in a removable access panel. 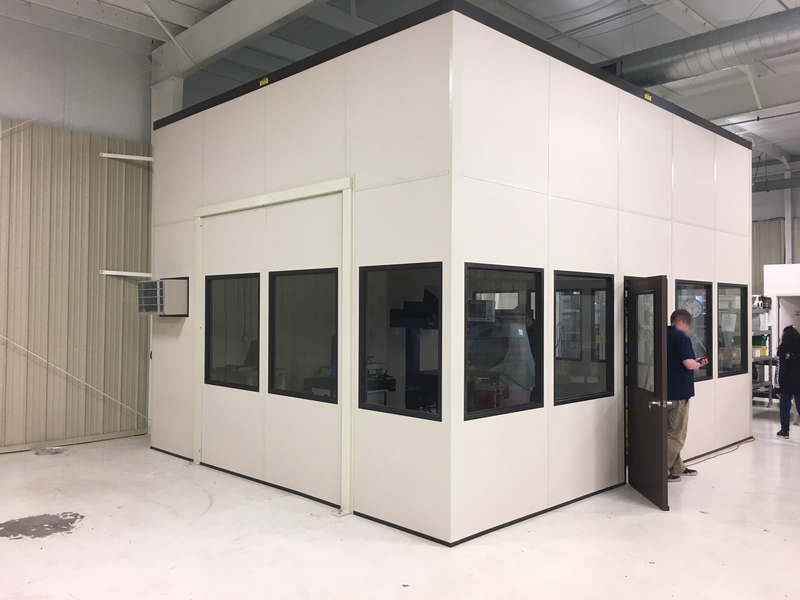 Recently, we provided a customer with a modular building to use as an equipment enclosure for their new CMM equipment. On a day to day basis, a 6’ wide x 6’8” high double door would be more than sufficient for them, but they wanted to be able to occasionally pass something larger through the doorway. If they were going to pass taller materials through the door way more regularly we could have ordered in a special 8’ high double door, but because they only needed once in a blue moon access we were able save them several hundred dollars in material by putting in a removable panel section above their doorway. Adding a removable panel is a fairly simple thing to do. The panels were cut in the factory to accommodate a 6’ wide x 8’ high opening. We took an additional panel section to cover the gap above the 6’ x 6’8” door and framed it in using the channel for the door frame and some additional “h” cap trim pieces we normally use along the top of the panels. We also installed “h” cap to the building panels at the opening above the door and fastened the removable panel to the opening. This sealed off the seams between the panels. 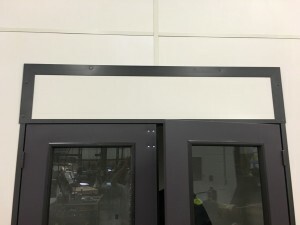 Now when the customer needs that little bit of extra space, all they need to do is remove the screws connecting the panel to the building, allowing them to fit their larger equipment through. 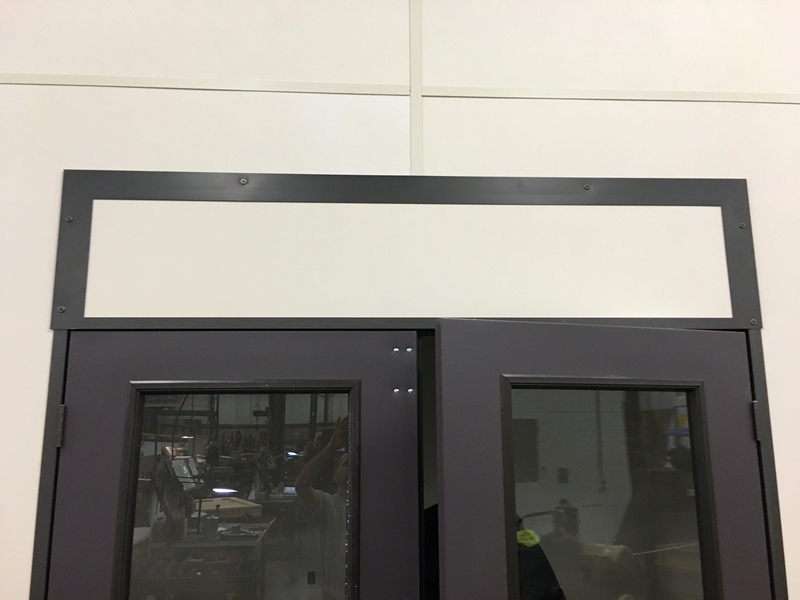 This entry was posted in acoustic control, modular enclosures and tagged access panel, cmm room, equipment room, modular building, removable panel on March 25, 2016 by Derick. Occasionally, I’m asked about how well our modular offices hold up over the years if they are designed so that they can be reconfigured in the future as your needs change. Surely, after general wear and tear they will want to just order a new building anyway, no? Well, I recently had the opportunity to visit an old customer of ours. Over the years, we’ve provided them with a number of mezzanines, catwalks, and modular offices. Several of the modular offices have been disassembled, modified, and reinstalled in different locations. While there, I got an opportunity to look at this old tank platform mezzanine and A-wall 300 modular office we provided them with back in 1997. The steel decking has started to bend up a little at the seam in a couple areas, but after almost twenty years of service the mezzanine and modular office were in excellent condition. 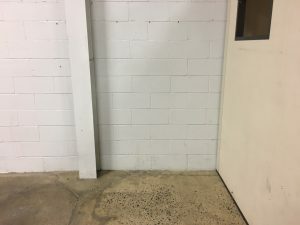 If the customer wanted to, it would still be a simple task to disassemble the modular office and put it up again in a new location, possibly with a few modifications. 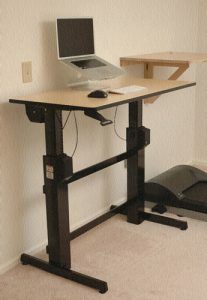 The components are all still compatible with what we provide today. 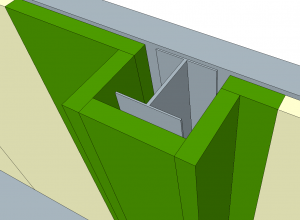 The only design change is that the I-splines used to connect the panels in the A-wall 300 modular building system are now typically painted to match the panels as opposed to the same color as the framing on the windows and doors. So yes, these modular buildings are built to last. This entry was posted in acoustic control, mezzanines, modular enclosures and tagged mezzanine supported modular building, mezzanine supported modular office, modular building, modular office on February 26, 2016 by Derick. The existing modular building with a through the wall HVAC, before modifications. Modular building systems are designed to be relatively easy to modify should the need arise. 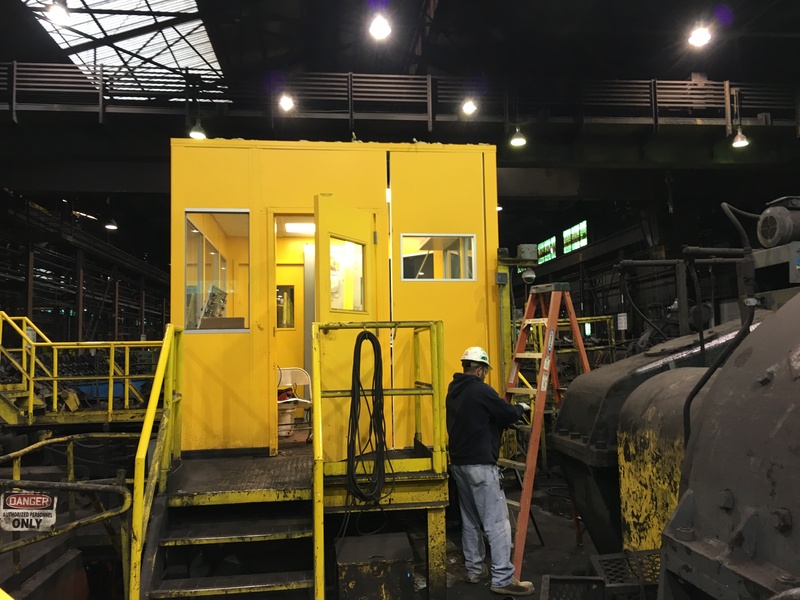 This past summer we put in this 10′ by 11′ odd shaped modular building to serve as a control booth at a steel plant here in Ohio. All the panels had a window in them, aside from a small panel on the end which held a through the wall heat/cool air conditioner. After everything was installed, the workers who operate the control booth determined that they wanted to add a window to that panel as well, and move the air conditioner above the window. Unfortunately, modular wall panels are not generally designed to support a through the wall air conditioner when placed above a window. We could, however, modify it to put the air conditioner below the window. Depending on the modular building system used, there are a couple of different ways to go about making the modifications. In this particular case, with it being a non-progressive modular building system with steel skinned panels, we reused the existing materials, and made the modification directly to the panel. We shipped the customer a new custom width window to fit inside the narrow panel, and some new trim for the framed HVAC opening as the customer decided to put in a heavier duty air conditioner while we were doing the modifications. All the other components were reused from the existing. The modifications were fairly quick and easy. When the installers arrived, they disassembled that section of the building to remove the panel in question. They then cut the modular building panel to fit the new window and air conditioner. Afterwards, it was simply a case of putting it back together. All said and done, it took two guys about half a day to complete the modifications. 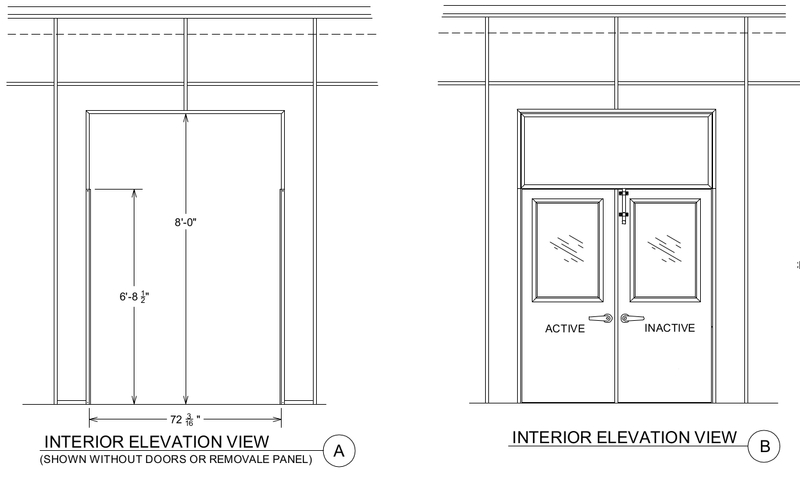 This entry was posted in modular enclosures and tagged modular building, modular building modifications on January 19, 2016 by Derick.